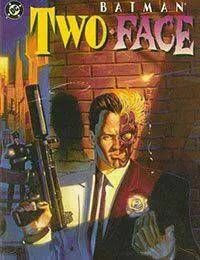 Disgusted with the rampant “hypocrisy” of Gotham, Harvey Dent goes on a rampage, setting bombs and instigating violence in both high and low society. But Batman sees through Dent's claims that he's “punishing” Gotham, deducing that the true target is man who truly created Two-Face: Harvey's abusive, alcoholic father.With love for his father in constant conflict with resentment from years of abuse and psychological manipulation, Two-Face is forced to wonder who he really hates: his father, or himself? Can Batman save both the life of Christopher Dent, and the soul of Harvey before the monster known as Two-Face obliterates them both?This issue was released alongside Batman/The Riddler: The Riddle Factory, to coincide with the release of Batman Forever.